Terex made its presence felt at the bauma China show in Shanghai. Bauma China attracted 180,000 visitors, which was a 20% increase on the show in 2012, while the brand new Genie® SX™-180, the astounding, self-propelled boom lift capable of telescoping to an unprecedented 186 ft working height, proved a major attraction for those who visited our booth. We hosted 10 Australian-based customers at the trade fair, and bauma China proved a great opportunity for them to see the scale of the Genie global team. After the show a number of customers enjoyed a factory tour of the first Genie manufacturing facility in the Asia Pacific region. Located outside Shanghai in the city of Changzhou, this state-of-the-art facility was designed and built from the ground up to manufacture Genie products closer to our customers in the Asia Pacific region. Since opening four years ago all of the models built in Changzhou are the exact same design and are built to the same quality standards as the Genie US models. 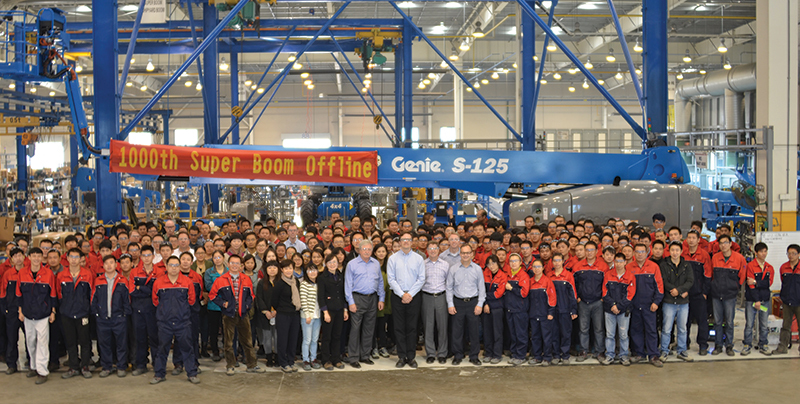 Currently, around 30% of the Australian Genie booms and scissors come to us from the Changzhou facility and this will continue to grow over the coming years as more models are introduced.